Achnamara01263 715779work01603 870304fax Self-cateringAchnamara, a detached property converted from part of a Victorian school, is situated in Cromer, a resort in North Norfolk with its theatre at the end of the pier, fishing boats, lifeboat museum, cinema, shops, restaurants, cycle hire and golf course. It is an ideal location for exploring the towns, countryside and nature reserves along the coast. • Other: Bed linen provided. Heating costs included June-Sept and £20 per week Oct-May, payable on booking. Towels may be hired payable on booking. • Notes: Unfortunately the property is not suitable for children younger than 7 years of age (unless babes in arms) due to the proximity of the car park. Green front door and matching garden furniture. 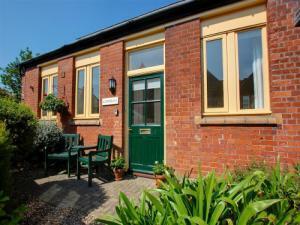 Achnamara, a detached property converted from part of a Victorian school, is situated in Cromer, a resort in North Norfolk with its theatre at the end of the pier, fishing boats, lifeboat museum, cinema, shops, restaurants, cycle hire and golf course. It is an ideal location for exploring the towns, countryside and nature reserves along the coast.